Back at Apple, by 1995 the aforementioned AOCE and its PowerTalk mail components (below) had been recognized as a failure on the same level as Copland, for many of the same reasons. Both tried to do too much, were built on shaky operating system foundations, and were demanding a lot from third party developers at a time when Apple's Macintosh looked like a poor platform for investment. PowerTalk had intended to embed messaging features into the Mac System Software, making emailing a document as simple as printing (below). Rather than simply adding email support, the system also intended to incorporate digital signatures and encryption features, handle foreign language messaging, manage user passwords in a system wide keychain, and support an extensible, abstract information cataloging system (described in a MacTech back article from December 1994: Exploring Advanced AOCE Templates Through Celestial Mechanics). In 1996, PowerTalk was finally put on ice and Apple changed its focus toward a software component strategy based on OpenDoc. 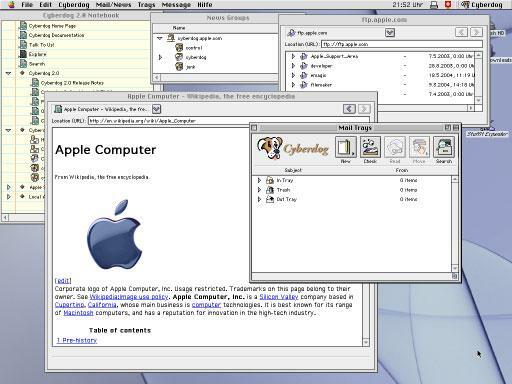 As a demonstration of what could be done with OpenDoc building blocks, Apple introduced CyberDog (below), a collection of email, web browsing, newsreader, FTP, and other Internet related components. 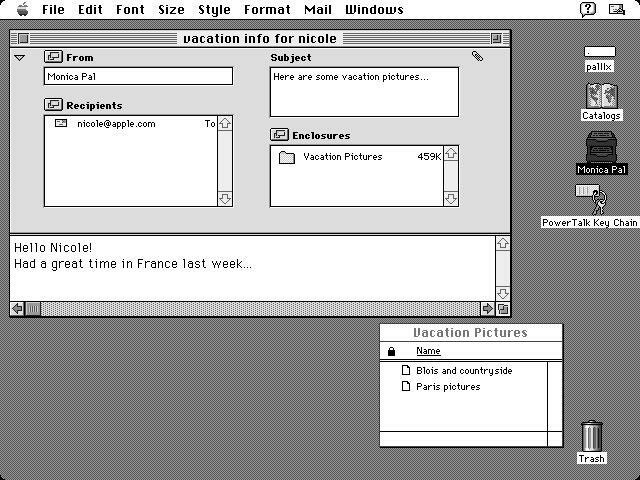 Apple's software subsidiary Claris also bought up Emailer (below) in 1994, which was popular among Mac users in the mid 90s. Emailer was canceled along with much of the rest of Claris' aging portfolio during the housecleaning following Apple's purchase of NeXT in 1996. After acquiring NeXT, Apple was quickly remade in Jobs' image. Apple immediately shipped a cross platform 4.2 release of NeXT's operating system as a demonstration of what the company had acquired. It included the largely unchanged Mail.app (below). 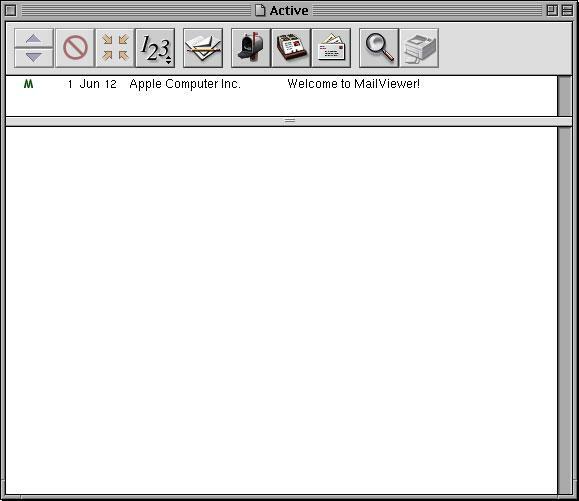 In 1997, Apple shipped NeXT's Mail.app with a Mac OS appearance in its Rhapsody developer previews, under the name MailViewer (below). When major third party Mac developers —primarily Adobe, Macromedia, and Microsoft —refused to invest in Apple's new platform, the company had to come up with a new strategy for migrating the classic Mac OS APIs to run within the new system, allowing existing, classic Mac OS programs to run transparently. This new strategy set aside Apple's original plan to rapidly migrate Mac users to a modernized version of NeXTSTEP. That involved extending the classic Mac OS 7.6 with interim releases over the next several years, while Apple reworked and modernized a new hybrid system of NeXT and Mac technologies that would result in Mac OS X. In 2000, the third developer release of Mac OS X debuted the new Aqua interface. 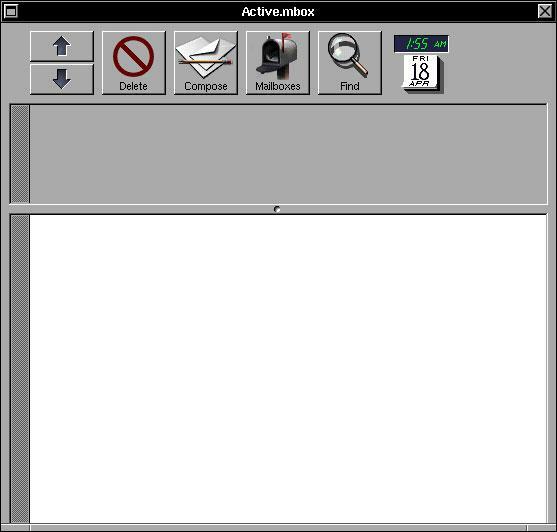 One of its design principles was the idea of slide out drawer windows, which the new Mail (below) used as a way to present its mailboxes. With its initial commercial release of Mac OS X, Apple shipped Mail 1.x (below). It offered integration with the new Address Book, which built both upon the PowerTalk concept of a system wide contacts repository and NeXT's NetInfo directory system. With Mac OS X Jaguar 10.2 in 2002, Apple added junk mail filtering and made continuing refinements to the overall interface. This was the first version of Mac OS X that was widely usable by mainstream Mac users. 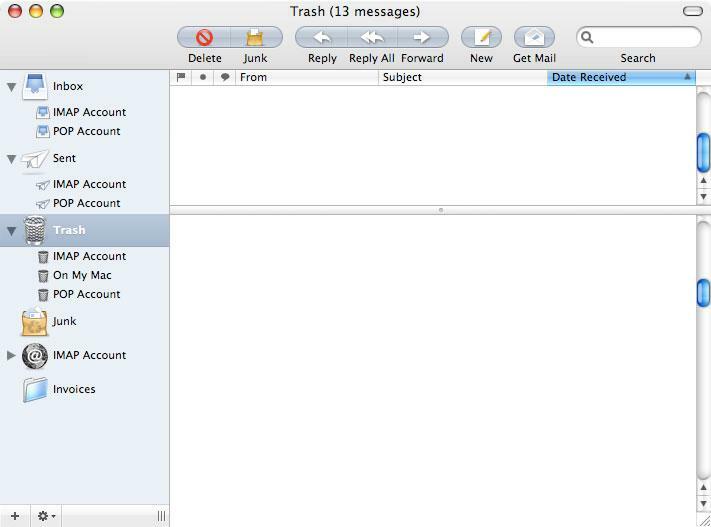 In their migration to Mac OS X, many left their former classic Mac OS email clients behind to use Apple's bundled Mail app. With Mac OS X Panther 10.3 in 2003, Apple added integration with AOL Instant Messaging presence indication provided by the new iChat, and some limited new interaction with the newly released iCal. Panther's Mail (below) was notable as being one of the few leading apps bundled in Mac OS X that wasn't converted to brushed metal. Address Book, iCal, iChat, QuickTime, iTunes, Safari, the Finder, and even the Calculator were all outfitted with a metal appearance. Mail did get a facelift however, which toned down its iMac style plastic pin striping and gave it a platinum title bar with close widgets set into it like gems rather than glued on top like gumdrops. 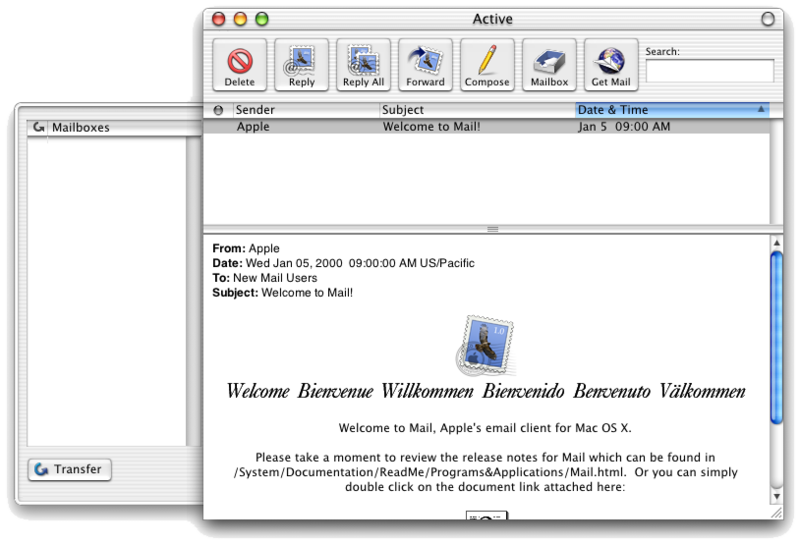 The release of Mac OS X Tiger 10.4 in 2005 brought Mail 2.0 (below). It got smart mailboxes, mail priority flagging, attachment slideshow features, an easy way to resize graphical attachments to save bandwidth, and closer integration with .Mac for syncing mail accounts, rules, signatures and smart mailbox settings. It also got faster improved searching overall thanks to Spotlight integration. In order to support Spotlight's search engine, the new Mail converted its email storage from a variant of the MBOX format originally used by NeXT —which put individual emails into a large database file, as most other email programs do —into a simple new folder structure that saves each email as a separate file. This allows Spotlight to search through email messages just like individual documents, and return email messages as results to a search. Mail 2.0 dropped its drawer and instead placed email account folders within a sidebar. It introduced a new unified look, which merged the toolbar into the title bar, creating a larger target for grabbing the window. Toolbar icons also introduced a bubble look, which grouped together more compact new icons by purpose. On page 3: Leopard's New Mail; To Do Reminders; Apple Data Detectors; Take Notes; RSS Feed Reader; and New Mail Source List.